Benefit: Oats are rich in avenanthramide, an antioxidant that protects the heart. Other oat accolades? The superfood lowers cholesterol and has been shown to possess disease-zapping antimicrobial activity, making organic oatmeal the perfect affordable breakfast item for cold and flu season. Benefit: Forget expensive steak and sausage. Dry beans and dry lentils pack a healthy low-fat, plant-based protein punch. Known as a "perfect food," just one cooked cupful can provide as much as 17 grams of fiber. Beans are also loaded with protein and dozens of key nutrients, including a few most people fall short on--calcium, potassium, and magnesium. Studies tie beans to a reduced risk of heart disease, type 2 diabetes, high blood pressure, and breast and colon cancers. Soak beans overnight and rinse them well to eliminate most of the flatulence-causing compounds. Benefit: This onion relative contains more than 70 active phytochemicals, including allicin, which studies show may decrease high blood pressure by as much as 30 points. High consumption of garlic lowered rates of ovarian, colorectal, and other cancers, according to a research review in The American Journal of Clinical Nutrition. To boost garlic's health effects, be sure to crush the cloves and let them stand for up to 30 minutes before heating them. Extend the life of your garlic by storing it in a paper bag in the refrigerator. Benefit: If you can handle the heat, this powerhouse pepper is worth your while. The heat in cayenne peppers come from a phytochemical called capsaicin, which can help clear congestion, fight cholesterol, melt away body fat, and jump-start your metabolism. Sprinkle it over veggies and beans to sneak it into your diet--just a half a teaspoon is all you need. Benefit: Eating four sticks of celery a day can produce modest reductions in blood pressure, thanks to the vegetable's rich supply of phthalides, phytochemicals linked to cardiovascular health. Single? Celery is loaded with androstenone and androstenol, pheromones that help attract women. Benefit: Tomatoes are our most common source of lycopene, an antioxidant that may protect against heart disease and breast cancer. Stock up at farmer's markets or from your own garden while you can. Canned tomatoes (a cheaper option when fresh tomatoes are out of season) can expose you to the harmful plastic chemical BPA, which is used in the epoxy coatings that line cans. 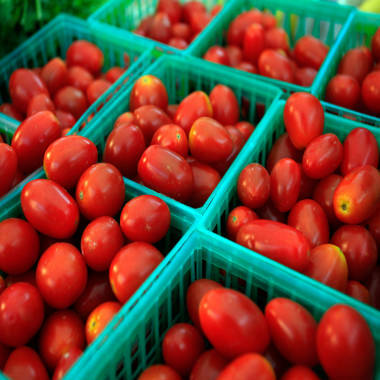 When fresh tomatoes aren't available, or aren't good, look for jarred or boxed varieties. Benefit: This bulb boasts far-reaching health benefits, including immunity-boosting compounds that can help prevent everything from the common cold to cancer. Onions are also rich in quercetin, a flavonoid shown to keep your blood healthy. It's also a must-have for natural allergy prevention. Tip: Store your onions somewhere cool and dry, such as a dark cabinet or unused closet, and that two-pound bag will last for months. Are You Ready for Rising Food Prices? Is Your Grocery Store Tricking You?